A visit to Brundage Mountain Resort is a getaway full of pleasant surprises. 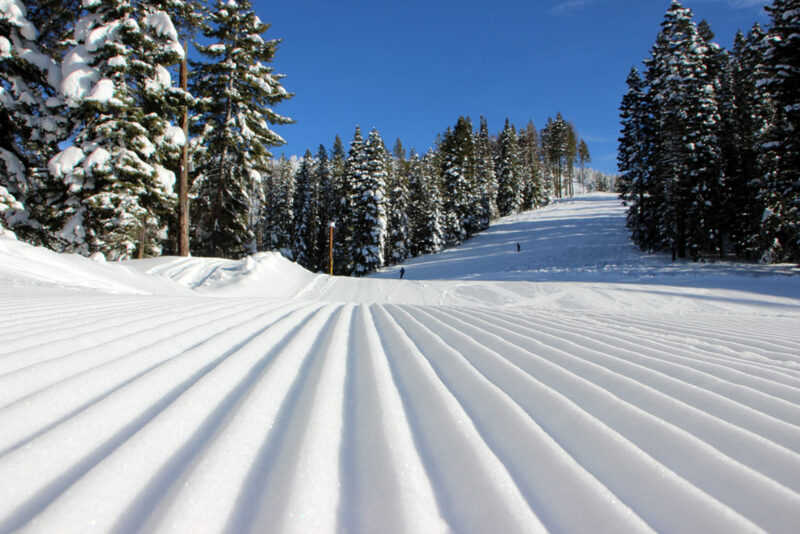 Generously wide groomed runs and a lack of crowds add to the relaxed feeling you’ll find exploring 1,920 acre Brundage Mountain. Five well-placed chairlifts handily spread out the skiers and riders, so visitors are more likely to find solace on an open trail than they are to find themselves standing in a lift line. A high-speed quad makes for a quick ride to the summit, where you’ll enjoy a 360 degree view that includes silhouettes of Idaho’s Seven Devils Wilderness, Oregon’s Eagle Cap Wilderness, and sweeping vistas of the Payette Lakes. The views highlight the fact that, in spite of the predictable heavy snowfall, Brundage enjoys a great many days of clear skies and bright sunshine. View Photo Gallery here. An overnight stay in nearby McCall, just eight miles from the Brundage base area, provides an experience of its own. This charming mountain town hugs the shores of Payette Lake and offers a wide array of dining and lodging choices. Contact InIdaho.com for pricing and availability on hundreds of lodging options. The local experts at InIdaho.com offer personal attention to turn your next trip to McCall into an adventure-packed getaway. No booking fees ever! Brundage Mountain is open seven days a week during ski season, which generally runs from mid-November through early May. Feel free to call us On the Mountain at 208-634-4151 ext. 124 or e-mail us using the form below. Snow tubing at McCall's Activity Barn is the perfect addition to your ski or snowboard vacation. A new twist on apres ski or tomorrow's great adventure - you don't need a lesson to take on this downhill adventure. Step back in time as you enjoy an old-fashioned sleigh ride in the scenic outskirts of McCall. Embrace the spirit of winter, meet the horses and enjoy spectacular views as you explore a snow-covered winter wonderland from a 15-person sleigh. Whether it's your first time on a sled or you're seasoned rider, a guided snowmobile tour gives you easy access to adventure! You bring the excitement, we'll dial in the details. Experience the Thrill of the Backcountry! Brundage Mountain Offers Guided SnowCat Adventures on 18,000 acres of backcountry terrain. You'll find more fresh turns than you ever imagined and enjoy exquisite views and exceptional food.